I really want a lavender! But a peach would be adorable too! I don't have any collections at the moment. I collect EFTs as well! I'll post a picture later. (: I currently have around 47 with no colors being doubles. I also started a new Rose Hair Clip collection and I'll try to post a picture of that soon too. 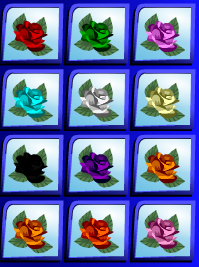 I actually collect rose clips too and I have a full page now! Okay. xD I'll post a picture when I log onto babv tomorrow lol.